When we met for the first time on a metro going to downtown Pittsburgh on the first very snowy day in January, I explained to you what my research was about and, even if the expression “inner song” isn’t an exact representation of the idea I wanted to convey, you understood right away what I had in mind and we decided to do this interview. Right. When you said inner song I knew exactly what you were talking about—that’s a perfect expression for it. It’s hearing the music and, in a lot of ways, an idealized version of the music and the sounds that you want to hear. And you walk around hearing, you call them “earwarms” , it’s a German word, a song that you get in your head that you can’t get out, and it can kind of drive crazy. That’s the worst-case example of the inner song. That inner voice is what you really use when you’re playing your instrument. You don’t make the sound and then react to it, you order that sound, that ideal of what you want, and that’s the sound that comes out of your instrument. That inner voice has to dictate the sound that you are going to make with your instrument; you have to do it all in advance. So, how does it work and where does it come from? It is like you have a recording in your head and you hear that music, you block everything out and you hear that idealized version of what you want it to sound like. Even if it’s just a single tone, a single note, you hear that note, and order your body to produce that sound. You call that “inner song,” but it is an inner voice as well. For me it is a sound which has a voice; the voice is the way to express it. As a cellist I hear it as a melody, but I can easily imagine that for some other people it is more harmonic. The harmony is the whole thing for me. It is almost an internal resonance that you physically feel. All art to me is very physical. When I see a painting, I respond to it not in any kind of intellectual way, I physically feel it. There is an energy that comes from it; even if it is flat and two-dimensional, it’s not really. The elements that go into the painting have a physical impact on me. There is a real physical presence to it. 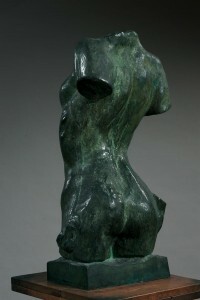 Sculpture is more obvious than painting because it is three-dimensional, physical thing. But I feel music in the same way and I talk about it as an internal resonance. It is more than just I hear an orchestra, I physically am feeling what that sensation is like. But that is how I respond to art. But that is the sensation that results from external sound; when you are reading a score, what happens to you? Once I physically feel that, it is like it is inside of me. It becomes a part of your own kinetic sense. And if I think about one of Rodin’s sculptures, “Torso of a young girl”, it was so beautiful, and I would laugh because there was a sign that says “don’t touch,” but it was like it was begging to be touched, the shape, the body. Even years later, I can physically feel that sensation. That recording is inside of me. The music is recorded within me in exactly the same way. We just played Beethoven’s 6th and there is a kind of valudaptory,…you’ve had the a storm, this kind of thanksgiving, and the song starts, based on a simple motif and the orchestration gives off a physical feeling. And when I hear it in my head, it is like I am sitting on stage hearing it. I have absorbed it and it is in there and in the right circumstances when it is quiet I can feel all of that again, just like I am experiencing it live. This external thing becomes an internalized in this way. That means that you had a previous external experience. Everything that you absorb. Anything becomes part of you. Your family members used to play music? Yes. Not professionally but we were a very musical family. My mother would sing, she would sing Gilbert O’Sullivan or English operettas. My father played trumpet. Music was always around. But it’s more than just music. There is always sound around us and our bodies are feeling it, hearing it, cataloging it. Whether we are aware of it, conscious of it or not, we’re recognizing that noise in the street means something big fell, or some work is going on over there for example, and maybe it’s dangerous. It is part of our survival. This ability to hear and to recognize is a part of our survival. We are constantly absorbing everything. Yes, it is like a library of sounds, a catalogue, a playlist. Even if you don’t record it specifically, it has been recorded for you: you can play that playlist back again. If I said to you “close you eyes and hear that sound of the big truck backing up”, you could do it. And you can do it—you could more than just hear it: you can physically feel the wobble of the truck and the motion in the air. Sound is a vibration– it is constantly hitting us and being absorbed by us. We all have that in common, we all have a sonorous background, but then some people develop it more fully? Yes. Sensitivity to sound is more than simply having perfect pitch. In music, very few people that I know have perfect pitch. Perfect pitch is about memory. Right. It is an intense form of hearing, and in music very few people have it. It can also be a problem. Yes, because you have less power to adjust this capacity. It can be an oversensitivity. It is like having a super-sensitivity to smell. That’s great if you work for a perfume factory, but an ordinary life, if you’re riding public transportation, that’s not very good! The other analogy I would make is: if I ask you to taste the wine that we had on Saturday night, do you think you could taste it? Can you taste some food that you grew up eating? I can taste an Oreo cookie. I can taste a certain kind a beer. You are saying that sound goes with memory. There is no sound without a history of sounds. Without some kind of a connection, a relevance to something else. So that sound I hear in Beethoven’s 6th, and that ending, is as much my experience sitting on stage as it is having listened to that piece as a young boy. That was was one of the first musical experiences I had, the first symphony that I discovered. I didn’t play the horn yet. It was actually a recording of William Steinberg and the Pittsburgh Symphony an old recording, and I would listen, in Washington DC where I lived, on a perfect day of Spring coming back from school. My memory banks to that piece are connected and tied to all of those things. Do you think that everyone has this kind of background? Is it personal to you, or is it something that everyone has? Everyone has an experience that some way relates to the emotion and the physical feel of what that music is like in that spot. And it may be completely different. It may be coming inside to a nice, warm kitchen. Or sitting by a fire after it has been cold outside. But it is the same sense of well-being, of contentment, and reverence and thankfulness. It is a universal connection, whether it is literally the one I have vs. what someone else has, the emotion behind it reaches the same thing, the same place. I think that is the power of music. So the sound is not abstract for you, it is very physical. It is completely physical. Even in my mind it’s physical. I feel it. (Starts singing the melody). I am getting goosebumps. This is the inner song. My voice is not good, but when I am singing it to you, I am hearing Paul McCartney, it was Alan Civil playing French horn. Even though I’m re-producing the music, I am hearing what I grew up hearing. That is my template or my soundtrack. So from your story, but also from my own personal experience, I have to say, I can deduce that choosing an instrument is like falling in love. Yes. I was playing my dad’s trumpet and I thought I was going to play trumpet, and then I heard this incredible sound (the horn). It was like that’s it, that’s what I want to play. It was this one particular context. So that sound, and then listening to other examples of horn….it was that inner sound. It is very special, true. That sound, even when I started to play, trying to play what I had in my head was trying to realize that inner sound. It was a memory of something. Yes. Imitation is a bad word for a lot of people. Not for musicians. It is an incredibly valuable and powerful learning tool. For a musician to imitate a sound or a certain style, even if it is not naturally organic to them, the ability to imitate it and to discover andto try out that voice, adds to the range of sounds that you have and are able to do in your head . So, when you play you are imitating someone you like before? 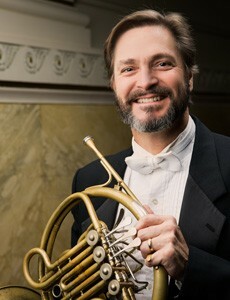 Like a particular horn player that you admired? That sound that I am hearing in my head, that I am trying to make, is related to someone else’s sound. But it is always personal because everyone is made up differently, I am physiologically different from the other horn players that I heard growing up, and in this way you discover your own voice. Imitation is a very important learning tool. Even though I’m imitating, a better word to use is influence. Each inner song is different. So influence is a better word to use than imitate. Yes. Because every sound you’re hearing is influencing the kind of sound that you want to make. I wanted to sound like this horn player at this certain point in time but then I wanted to sounds like that different horn player at another point in time., or this player, or that orchestra. You are led by a desire. Right. It gives you an idea of the ranges of sounds that you can create. And that’s why it is not really imitation at that point, it is more influence. So the difference between influence and imitation is what? How can you give them different definitions? If you are imitating something, you are “aping”,(like ape, the animal, plus -ing) you’re trying to make it just like this thing. But if you are influenced, you are including the elements that you like, in order to move you in that particular direction and to be a part of your voice. You take just what you like. There is a passage in the 3rd movement of Beethoven’s 6th (the hunting scene) when the horns are really barking, and on some recordings the horns go “(makes noise) , whereas on other recordings, they go “(makes a different noise). But the real “cors de chasse” are really not very musical . But really exciting. There is a very famous French group “trompes de chasses”– I have recordings of them and no one else in the world plays it like them, or sounds like that. But you can take an element of that, a flavor of that and when you play Beethoven’s 6th you do so while employing a very barky sound at one point, but a very whizzy natural horn sound when you begin to play loudly. When I was younger, I strived for a big , full, rich sound, round and full, but that is not at all the way that a natural horn sounds. Then as I’ve gotten older, my tastes have changed, I got more educated, I acquired more influences and I now hear the horn with different qualities, there is a different flavor to the sound. That is an example of how to take a flavor or element of a sound and without imitating it or absorbing it, allowing it to become a part of your own voice. What changed for you while getting your education? When I was first playing, it was all about the sound that I was making, it was all about “this is what I think of as the horn sound,” but it wasn’t about “this is the way that the horn needs to sound.” It was more about my concept of what I thought the horn sounded like. But when you become more educated, the music itself dictates to you what kind of sound you should get. It sounds esoteric but, the music speaks to me, saying, “I need to sound like this.” When I was younger, I came first, but when I became more mature as a musician, I reached the understanding that I was just a part of this music that was much more important. I was a component, and my sound was a component of that overall sound. There are regional sounds and schools. There is a New York sound, there is a French hunting sound, and there is a Chicago sound. There are schools that are influential to young players. I listen to the Chicago symphony and I loved some elements of that sound, so you listen and absorb. It is the same for, I think a lot of instruments—and maybe more pronounced for some instruments than for others. Each instrument is thus appealing to a kind of context. Yes, for example when music was making its transition from the Baroque Era, from religious music, music had always been used for religious, for ceremonial, trombones were to represent God in religious music. As that all evolved, composers became more secular, composers looked for instruments that would add flavors and colors, as well as harmonies changing and the music becoming much more complex; part of the complexity was adding different voices. Romanticism was an evocation of nature, and a glorification of natural things, and what could better represent nature than the horn? Or the shepherds’ pipes, which is the clarinet? Or the flute? Or the oboe ? So almost all of the early composers added almost as a novelty, the horn, the oboe. It’s true that, for me, the horn is nature. but I think it’s earlier than that. I think Weber, Freischütz, uses a horn quartet right at the very beginning, and that’s nature, that’s the forest, the beauty, the majesty that’s in nature. So, the horn is romantic. To him, the instrument represented the hero’s life for Strauss. It is the kind of ultimate romantic instrument. But even in Pre-Romantic music the horn was used quite a bit, by early Baroque composers, for example. So your education consists also in understanding the context of the horn, what is represents. So how do you know that? Listening to other interpretations? Yes, but more through knowing the music and being in sync enough to the music, being emotionally connected There is a passage in Malher’s “Das Lied von der Erde,” in the first section, and the horns have this spectacular line. It is so evocative. So powerful. As a teenager, when I first heard Malher it was like I had known this music my whole life, it went straight into me. It was immediate. And maybe it was just because I was a horn player, because they all wrote horn parts– Dominating, leading, just beautiful horn parts. But this passage in “ Das Lied,” we did it with a conductor here, and I sat in different places. It sounded spectacular, and the conductor said “oh no no, no horns, no!” but we went into the concert wanting to play it in this fashion. The conductor had to accept that it had to sound this way. I don’t care if he says no! I’m not going to not play it the way it needs to sound. So, how do you balance your own opinion with that of the conductor of the orchestra? The music comes first. That famous horn trio I was talking about in Beethoven’s 3rd is fantastic. A teacher of mine had a conductor who asked him to do a subito diminuendo, but he said somewhere in that concert hall, that note that he played is still vibrating, he played it so loud. So he didn’t do a diminuendo, he did just the opposite, he said there was no way he was going to play a diminuendo up there. Because the music said, Beethoven said, the whole joyous explosion of it , the culmination doesn’t go like this. It goes like this. So he didn’t do it (the diminuendo) in the concert. I remember during the Alpine Symphony in Paris, the horn players were located in the Opera, they were walking around the room, and we were in the middle. We really felt like we were in a forest. That’s a great passage yes. In this case, you have to balance the sound with the whole orchestra because the horn sounds very loud in comparison with the violin, for example. Exactly. And you can’t just do what you want because you think it’s right, and not take into consideration the effect that it has on the overall performance. Although sometimes, we’re too loud. Sometimes it’s louder than the conductor wants, and I listen and I shake my head and say, “We’ve gone a little too far.” What is really difficult is to play opera, because the music is so beautiful and so moving and so compelling , and the voices singing—and you just want to match the voice, but the orchestra is so much more powerful than the singer on stage, so you’ve got to suppress enough of that so it doesn’t overwhelm it, but you have to have it still come across. I think about this marvelous passage in Madame Butterfly, this wonderful music, so passionate, and yet, you have to repress it and hold it back, when on stage…there’s passages where you’ve got to be under the singers. The music has to come first because in this case, the music is not the orchestra– it is the singers with the orchestra accompanying. The Metropolitan Opera Orchestra to me is one of the great orchestras in the world, because they capture all the passion, all the emotion, all the intensity, without completely overwhelming the singers. And in this case, the horn players in the met, they get a very transparent sound, we (in Pittsburgh) get a much more compact, direct sound. It’s a fuller sound, but it doesn’t have the compactness and the horn that a lot of orchestras in general will get. In a certain way, there is therefore both your own innersong and the orchestra’s innersong. How do you achieve a global sound? The conductor does that, but we talk a lot together. You work at home and then you come together only two or three times to rehearse? who died last year. I loved working with him. The orchestra really respected him, so there was no insubordination. It is a kind of material. It is. It is a medium. That sound that we get is something that’s grown and evolved and changed, but has a little bit of everyone who’s ever been here in it. It is identity: something that changes and but also remains. That sense of insubordination, it is a strong word but an accurate word, really happens when the conductor doesn’t respect the musical imperative and the musical history of the organization. There’s no question that a music director, not the conductor generally, but specifically the music director has the control of the orchestra and they definitely influence the sound and direction of the orchestra. For each orchestra there is a music director and many conductors. Exactly. The guest conductor also has to come in knowing that “this is the way that this orchestra sounds.” They have to work with that, teh sound that we have already developed. We try to go towards them, work with them, the sound that they’re after, but they also have to come towards us. Sometimes it is a terrible match and they never come back to play with us. So, you decide who comes? We have an influence. Some orchestras are very bad about treating conductors. Our orchestra is very nice! But some orchestras, if they don’t like the conductor, they make sure the audience knows it, the management knows it—they play poorly. It is rotten. But you can sense when there is a good relationship or a bad relationship. And some of you, some instruments, have more importance? Depending on the music. I mean the most important section in any orchestra is the string section, you know, it’s huge, and that’s the sound of the orchestra. The winds are really coloration in a lot of respects.The string section is the heart and soul of the orchestra, I think. The string sound has the biggest influence on how the orchestra sounds. And the winds, although you have much more individuality too, has to function as a choral as well, as so does the brass. Everyone has an independent part. Yes. Everyone has their independent parts, and you’re a lot more exposed. Every voice has got an individual importance to it, but you still have to function as a group. But then I would like to add something about the sound. One thing that’s different for brass players than any of the other instruments, is that we’re literally singing with our lip when we play. You’re talking about the inner voice–the sound has to come from your mind first. There is a signal which comes from your nerve, a command, and it goes to your vocal cords. If that gets damaged, you can’t speak because the signal doesn’t go off. The brain has to send that signal in order to make that vibration in order to become a sound. Once it does that, the air naturally follows. When you talk, do you think about breathing? No. You think about the sound, the idea that you want to communicate, the sounds that you have learned since you were a little baby, how to communicate that, and your brain signals that vibration, that idea to come sound originate when you talk? It’s exactly the same for us, for music. But it is more than that. As a little baby: your mother talking to you, your brother talking to you, all those sounds are in there, and your brain is cataloguing them, and you can reproduce them, but it takes –you’re not thinking about the air that is then pushing that vibration out into the world, and physically sending that vibration out. The same exact thing happens to us. We hear the sound, I hear a pitch….and yet the air follows. If I just blow, that doesn’t do it. So what makes your own voice? Your voice, particular to you. For a cellist, it is your physiology, how your hands are made, for example. Your physiology. It is your lips, your inner cavity, your dental structure, your oral cavity, your sinus cavity. I’ve always thought about people with big heads, singers with big heads, it’s like a giant, resonating chamber. I know some horn players with some big heads-they get this huge sound. Think about Pavarotti with his giant head! Your physical set up, in conjunction with this idea you want to play creates your sound. I think that the concept is more important than anything, but what then changes it is then your physical makeup. That influences your sound in a way that makes your voice your voice. There was a horn player I used to love when I was growing up, I was trying to sound like him, but I’m not built like him, so even though I was hearing his sound in my head, what came out of my body was my voice, my sound. I may want to sound with my voice, when I sing, like Paul McCartney, if I sing opera, I want to sound like Pavarotti, and I may hear Pavarotti , but what comes out of my voice is not like Pavarotti, but he’s got a body that’s that big but his head is enormous! His sound, his physical structure, is ultimately going to dictate what that voice sounds like. He may grow up hearing Carlo Bergonzi, or his father, and may want to sound like his father…(implied-but he won’t b/c his physical structure is different). Bergonzi-it’s a lighter voice than Pavarotti, but it’s classic. So in order to be a great musician, you need to possess the capacity to admire someone else. Yes. You should see on Youtube Pavarotti singing with his father. It is fantastic. It’s genetics but it is more than just the physical similarity, that’s the sound he had in his ear. It is a really beautiful thing. For us horn players, that signa, it has to come from this unknown place, it’s this reservoir of sounds that we have in our head, that’s the only way that we can produce these sounds. It is not like a wood-player, we are not blowing air against our lip and making it vibrate, we’re making the lip vibrate, and the air just naturally follows, just like the voice. So we’re literally singing with our lip. Some people have had dental work done and that nerve has been damaged and they can’t play—it’s kind of devastating. That’s a tragedy. There are some musicians, when they have dental work done, who never used pain-killer (Novocain), because if the Novocain hits the nerve, it can permanently damage it. I understand. So in your inner song, there is something that belongs to you, and something that is beyond you. that music is not about him, it is about his human soul. It is just coming out of somewhere else. But I’ll go back to Brahms. It’s about his soul, and that goes through me, and I’m like a prism. And it goes through my soul, and then comes out of me. So it’s Brahms’s, but it’s Brahm’s soul coming through my soul, and when you hear it, it is going into your soul as well. And it is this collective, unconscious connection of souls when music is being made. Gershwin was an American Jew of Russian decent and he wrote this music that sounded like the music of Africans, slaves, from the south, in our country. But he understood the soul of this music, the essence of the music. Even though it’s going through a a Russian Jew, it’s being sung by a black American—it’s universal. It can be sung by anyone, and it works, and there’s a universality to it, because there is universality to all human souls. There are lots of cultural differences, there are physical differences, but in terms of that unprovable thing called the human soul, I think it’s universal. And it is very Jungian, I think, isn’t it? Probably… I am not an expert! Zach, thank you so much for this wonderful encounter, hope to see you very soon in stage!